Welcome back to this ongoing tutorials series. 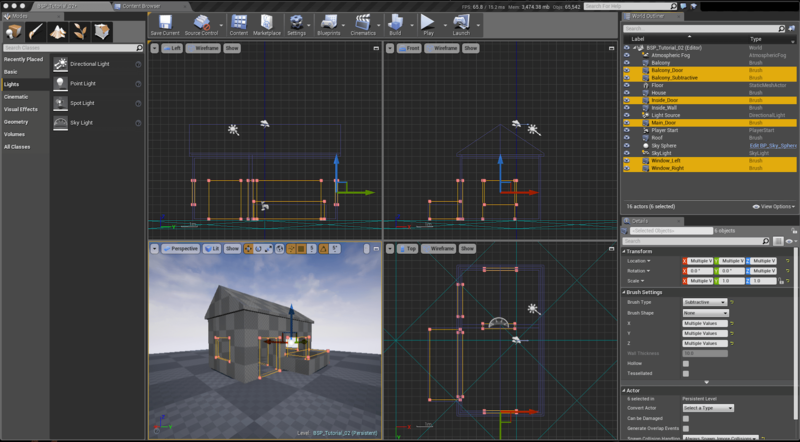 Now that we’ve covered what BSP are and why we use them, we are ready to begin prototyping our first level. 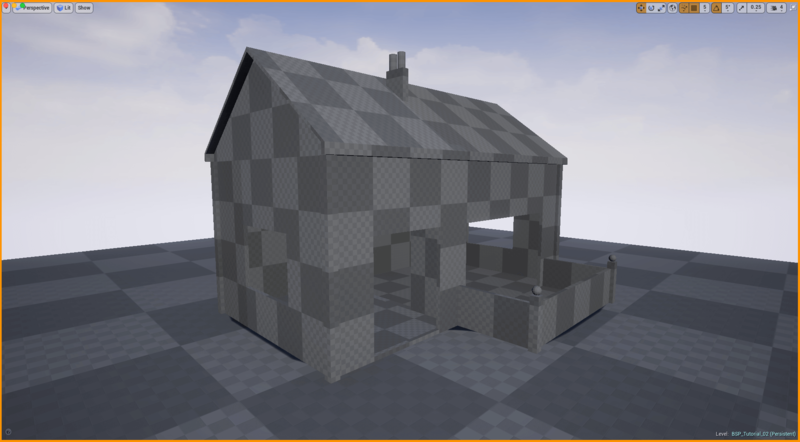 In the last tutorial I presented you with a challenge, to prototype a very basic design of a house. Let’s see how you can accomplish that. That’s our goal for this tutorial. 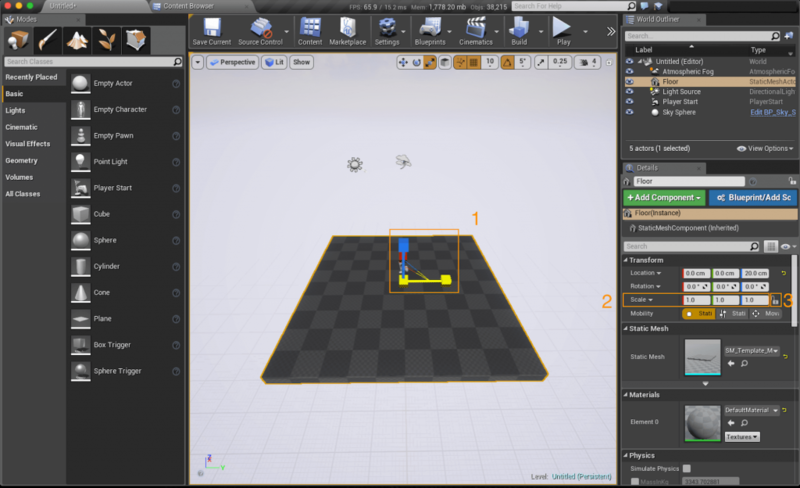 Run the Unreal Editor. 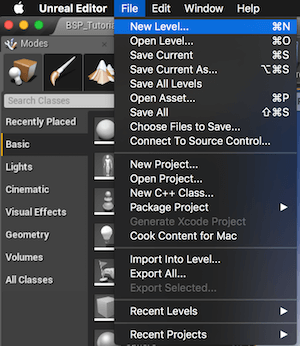 Once the editor has loaded go to File and select New Level (Ctrl+N for Windows or Cmd+N for Mac users). The New Level prompt will show up. 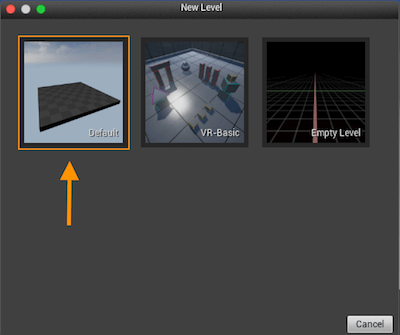 There click on the Default level to create a new level. Once the new level has loaded press the Save Current button on the Toolbar panel. This saves our new Level, now give it any name you like. Go to the Modes Panel, make sure you are in Place Mode (Shift+1). 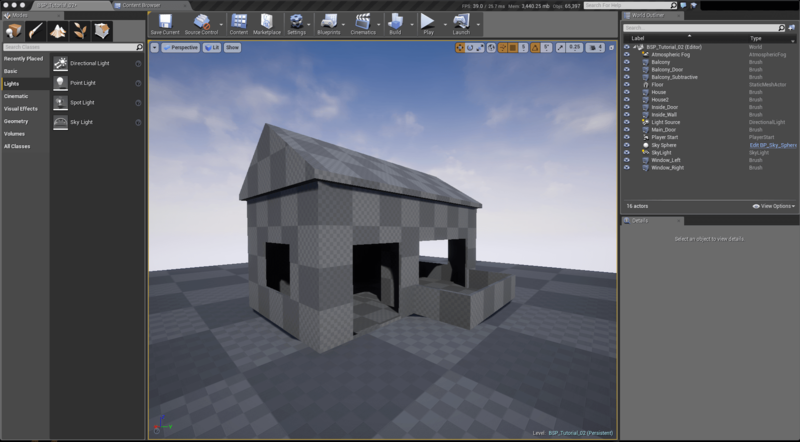 In the viewport select the floor and change the scale, make it large enough to fit the house. One way you can achieve that is by using the Transform Gizmo (1). Another is by manually entering the values in the Details Panel, under transform, Scale (2). The Lock icon you see next to the Scale values indicates whether or not the values change individually (Unlocked) or all at once (Locked). Go ahead and play around with the Scale values and the Lock icon to see what they do. Make sure you have Surface Snapping turned on. When enabled actors will snap to surfaces in the world when dragging. This will help us to keep our actors easier in place. Set the Position Grid Snap to 10 or 100. Also place a Sky Light in your level, to brighten then place up a bit. 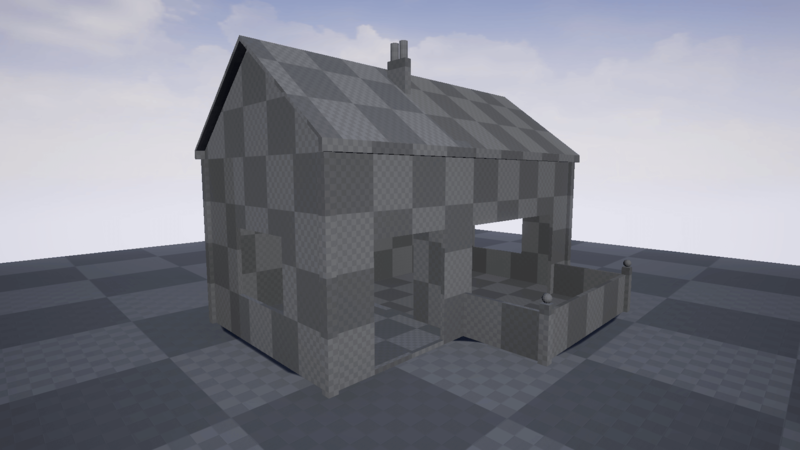 Now we are ready to begin prototyping (blocking out) our House. First we will block out the rooms. The fastest and easiest way to create a room is by using a box brush. 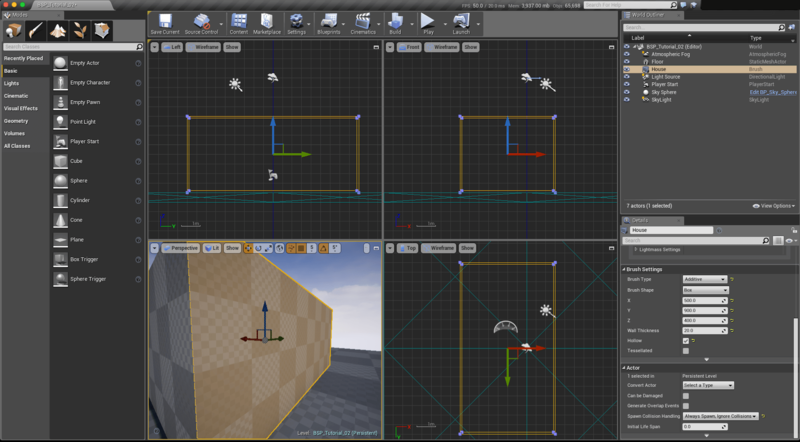 On the left you will see some tools, the sixth from above is the Geometry or BSP tool. 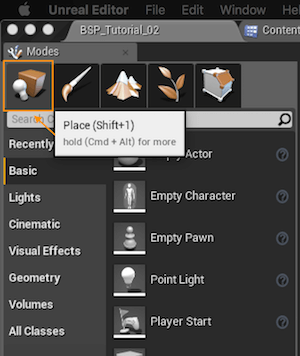 We will use the BSP tool for quickly prototyping (also known as “blocking out”) our level. Drag a Box Brush in your level and give it the following Scale properties X 500, Y 900, Z 400, Hollow, Wall thickness 20. Name your brush “House”. Although it looks like a solid box, it is hollow. Click on the upper right corner of your viewport, to make the three orthographic views appear. Your viewport should look like the one in the following screenshot. 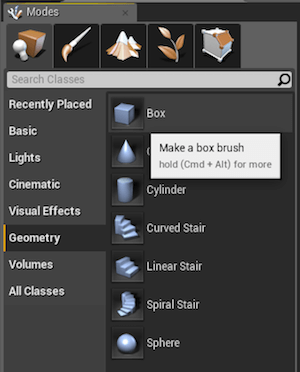 Observe how in the orthographic views you can see the walls inside our box brush. 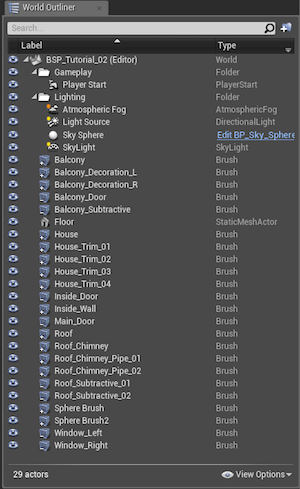 Drag another Box Brush, place it inside the Box Brush you just placed and give it the following properties. X 190, Y 440, Z 150. Name your brush “Balcony Sub”. We used two brushes to create our desired shape. There are more advanced ways to create this shape. 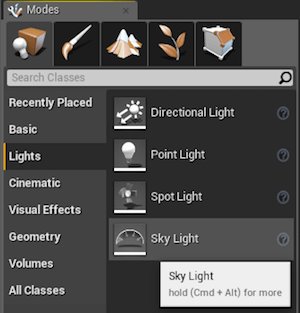 More on that in our in a future tutorial where we’ll take an in depth look at the Geometry Editing Mode. 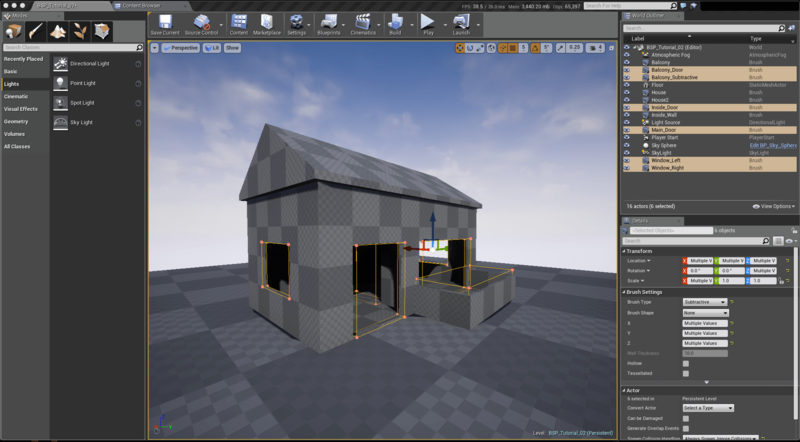 In the same manner use the box tool to create the doors, windows and inside areas of the house. You can use the dimensions and names provided for the various parts of the house or use your own values and names. The final result should look similar to the following screenshots. I’ve gone ahead and added some details to our house. Naming your assets in the World Outliner is very important. It keeps your assets organized. Besides naming individual actors you ca add them to folders too. A good practice is too keep actors with a similar functionality in folders. 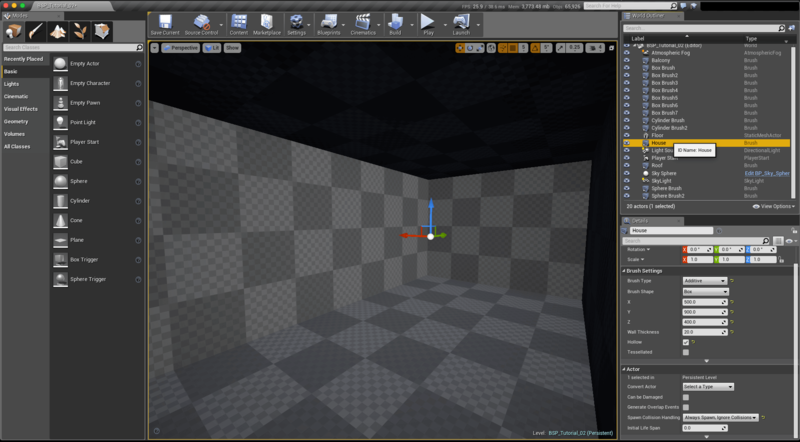 For instance you can keep your lighting in one, your fog in another your FX in a third. You can also organize them based on location, Dungeon 1, Dungeon 2 etc and in there use sub-folders to separate lights, puzzles, FX etc again. With the knowledge you gained you can go ahead and add some detail to the house if you wish. Have fun experimenting with the BSP brushes, you can create some really cool objects. Don’t forget to organize your actors in the World Outliner. Picking up a good workflow early on can keep you away from picking up bad habits. That’s it for this prototyping tutorial. In the coming Hotgates tutorials we’ll import some assets from a DCC (Digital Content Creation) application such as 3ds Max, Maya, or Blender to replace those BSP brushes. 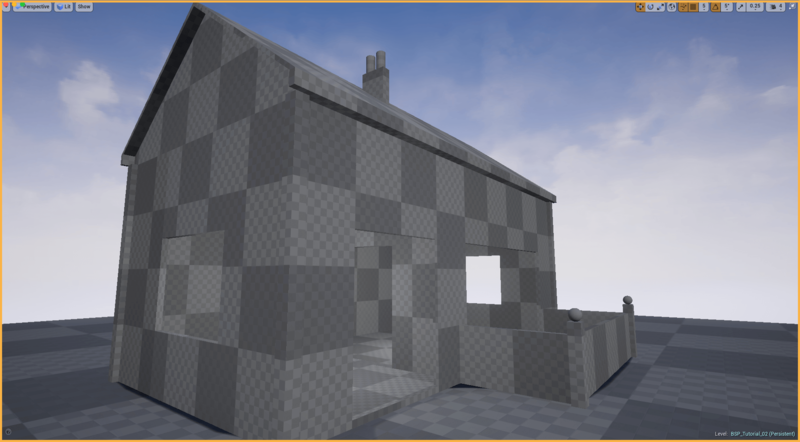 We will also take a first look at applying materials on both BSP brushes and Static Meshes. Thank you for reading and till our next tutorial keep it Unreal. There is also an very interesting thread in the Unreal Engine official forums about BSP, and it’s here.